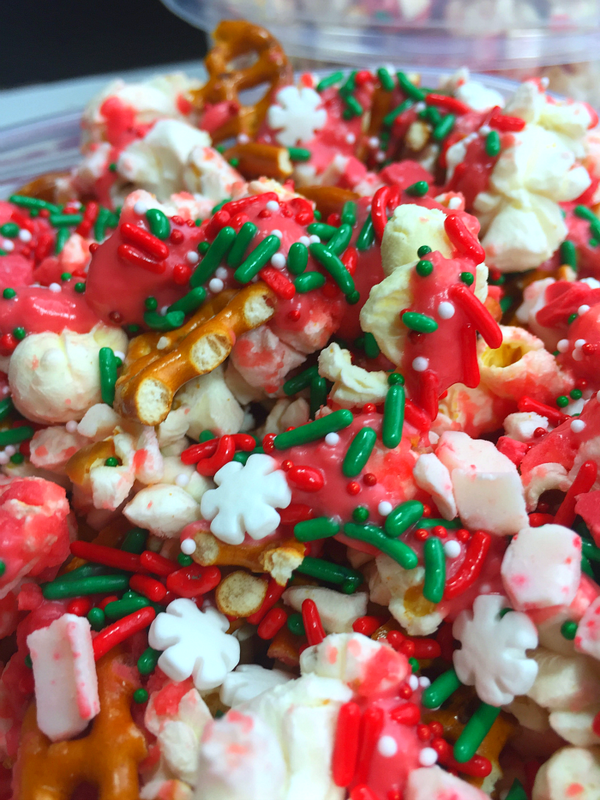 The creation of my super yummy Christmas Party Popcorn recipe is inspired by the delicious tastes and festive colors of the holiday. The days between now and Christmas can get really crazy if we’re not careful. We can get bogged down with holiday preparation to the point that we’re frustrated on Christmas morning and end up being the Grinch who stole Christmas instead of a fun loving person we are. It’s easy to get sucked into a million holiday idea if you spend any time online. Everywhere you look someone is sharing an ideas for something delicious to eat or fun to make. I’ll be the first to say, I’m drawn to both, but I am smart about how I choose holiday recipes and crafts. I only create crafts that are simple and recipes that can be made ahead like this one. 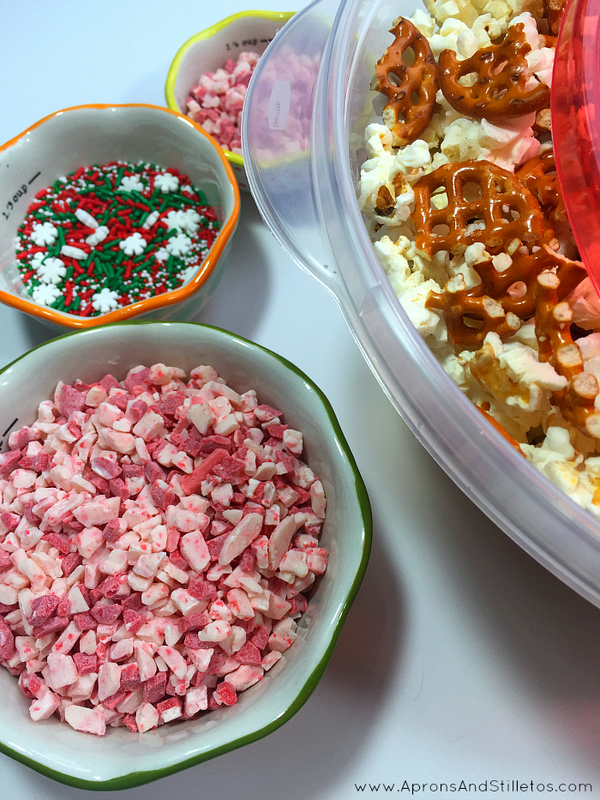 The fun part of my Christmas Party Popcorn, is when placed in decorated Rubbermaid TakeAlongs, they make a great food gift. Here’s how I made the popcorn. I mixed my popcorn and pretzels together in a large Rubbermaid TakeAlongs Serving Bowl a few days before I am ready to make my recipe. Once I’m ready to assemble the party popcorn, I melt one cup on the chocolate according to the package instructions, pour it over the popcorn/pretzel mix and fold it all together. I mix it pretty fast because the chocolate starts to harden soon after pouring. 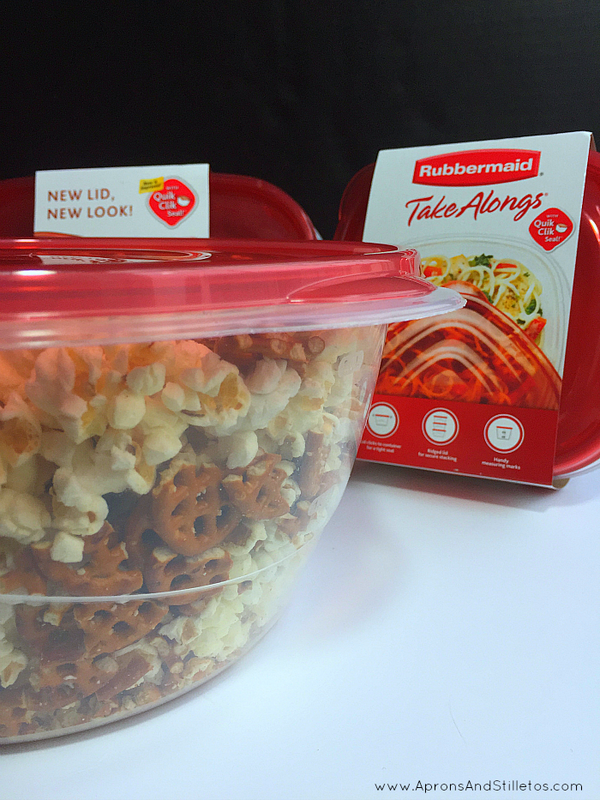 Next, I did divide the popcorn/pretzel mix between a smaller Rubbermaid TakeAlongs containers. Now, I melt the remaining 1/4 cup of chocolate and drizzle it over each bowl of Christmas party popcorn mix. While the chocolate is still warm, I sprinkle on the Christmas sprinkles. I fill each bowl to the rim and never worry about the containers opening. Rubbermaid’s Quik Clik Seal™ technology ensures each container is secure. The lids are super soft, and flexible to accommodate a god bit of popcorn. The last thing I do is decorate the containers using felt snowflake shaped coasters. Having the coasters attached is great for bring this popcorn bowl to a party. Bring it in the TakeAlongs Serving Bowls, pull off the coasters, place cups on top and pour beverages to accompany the popcorn. Here’s a quick tutorial showing how I decorated the Rubbermaid TakeAlongs with the coasters. The Rubbermaid TakeAlongs come in holiday colors and prints as well, which are perfect for foodie gifts or if you don’t have time to decorate your container. Are you craving more yummy recipes and easy craft projects? Be sure to check out ideas from me here and from Rubbermaid here. The creation of my super yummy Christmas Party Popcorn recipe, supplies and shopping trip have been compensated by Collective Bias, Inc. and its advertiser. All opinions are mine alone. AND thanks for linking up to Funtastic Friday! Wonderful food that doubles as holiday home decor. Love it. This looks like it could be trouble! 🙂 Visiting from #fdflinkparty! Omg that popcorn looks phenomenal! I've never seen it with pretzels added! I have never eaten popcorn and white chocolate together. What an interesting idea ? Since I have 2 little ones this Christmas I wasn't planning on making anything fancy to take to holiday events but you changed my mind! 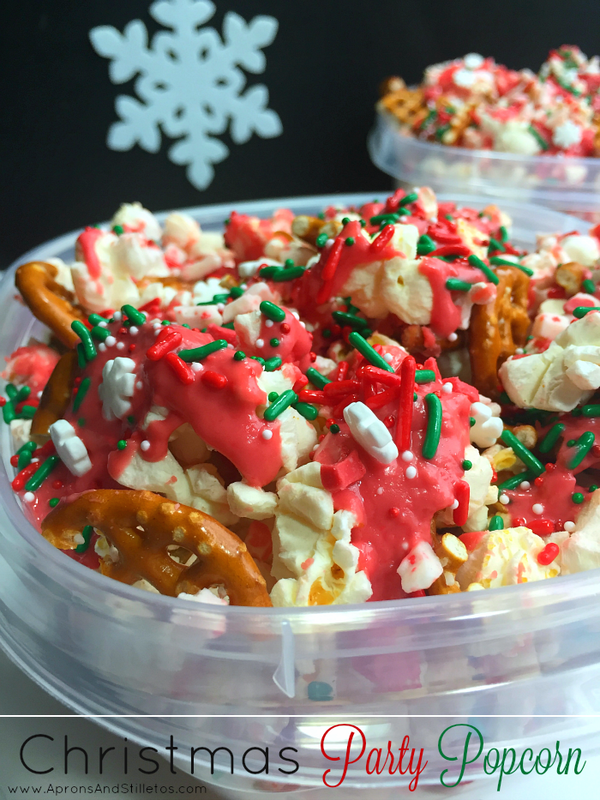 Our family loves popcorn and I think this not only would be an easy treat but tasty too! 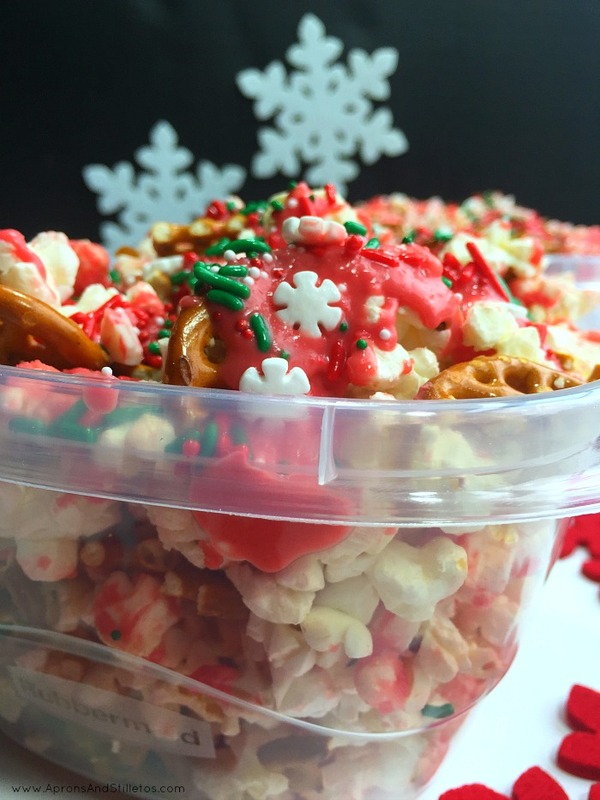 Sounds and looks deliciousooooo Saidah I dont normally have popcorn for Christmas yet am strongly tempted to try this recipe for snacks, and storage idea is great. They might all disappear before xmas tho lol! That looks so beautiful the way you made it! Also, those Rubbermaid containers are my fave!